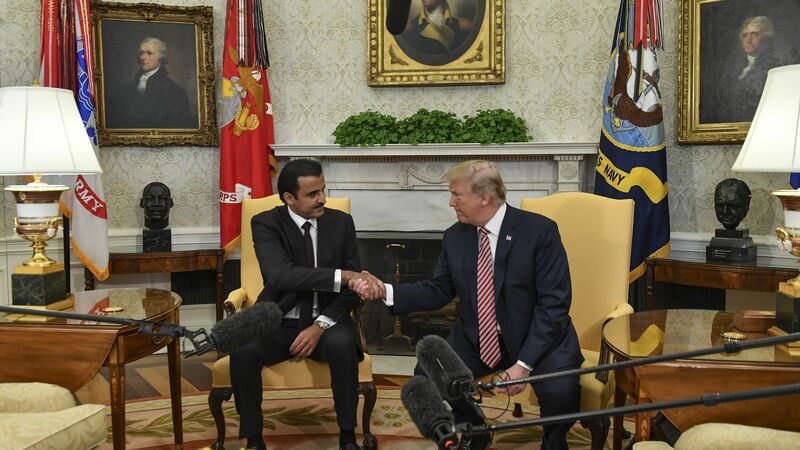 President Trump's meeting with the Emir of Qatar on Tuesday is a sign that the U.S. is "getting our normal historic relationship with the region back on track," according to David Mack, a scholar at the Middle East Institute and former U.S. ambassador to the UAE. Why it matters: The breakdown of relations within the Gulf Cooperation Council (GCC) has "weakened the United States," Mack told Axios, when it comes to handling international terrorism and confronting Iran. The backdrop: When Saudi Arabia, the United Arab Emirates, Bahrain and others cut ties with Qatar last summer, former Secretary Rex Tillerson wanted to work to restore relations. But he was "undercut by the president" and by Jared Kushner, Mack says, which "made U.S. diplomacy in the region very, very weak." Looking forward: Mack said a united GCC is crucial in acting as a "deterrent" to Iran, which is the "only country that has been gaining by this disarray among the GCC states," by developing a relationship with Qatar. And as we near the the May 12 deadline set by Trump to "fix" or withdraw from the Iran nuclear deal, a united front in the region could be hugely beneficial. But, but, but: Mack says the situation could improve rapidly, if the U.S. presented "a coordinated policy using a robust diplomacy, along with our military relationships with these countries." He's looking for Mike Pompeo and James Mattis to coordinate closely on the issue. Keep in mind: There have not yet been ambassadors appointed to Qatar, Saudi Arabia, Kuwait, Oman, or the UAE.